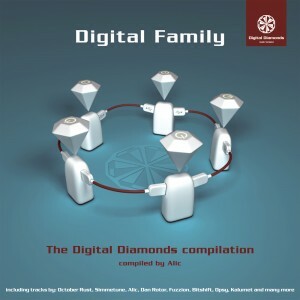 Digital Family is the first compilation from Digital Diamonds, a German netlabel specializing in deep techno and futuristic techtrance with a psychedelic edge. Compiled by Alic, this release features stellar contributions from label members Dan Rotor, October Rust, Simmetune, and Opsy, BitShift, Viker Turrit, and Digital I/O. Well-known acts Fuzzion and FM Radio Gods also provide source material for an intriguing pair of remixes. To round out the credits, Digital Family has been mastered by Volker Jakubzik and features cover art by JP-Huss. MP3 Download | FLAC Download | WAV Download · Download count: 23,494. Digital Family is available under a Creative Commons licence for noncommercial usage. Be sure to leave your comments to support Digital Diamonds and all the people who worked to provide this high-quality release free of charge! Visit Digital Diamonds on MySpace or view their full catalogue here on Ektoplazm. Epic! I’m really glad I was to be part of the first 200 to hear this. Perfect! Very much liked !!! Wonderful VA with awesome artists!!! Digital Diamonds,label which already has his own place on the scene of psychedelic techno production,now comes out with his new and eight release,just this time in a form of digital compilation. German Audio Advance label, which with full law carries already mentioned prefix, pull down all prejudices about releasing quality techno trance sound as well as artists who promote. Under the watchful eye of producing duo from project Alic, who are on the releases of many labels such as Nachtstrom Schallplatten, Hoofs & Horns, Boshkebeats, etc…the world’s techno trance scene redolent with fresh sounds who comes to us from one more of many sides that made her completed. In this new release titled “Digital Family”,many members of label introduced to us, as well as many good-standing projects and newcomers. After many times of listening i felt the moment in which I can put the comment on this first release in a form of combination of many artists on one place. Therefore,don`t losing time but get started. One of the oldest members of label, in order of things, gets that honor to open compilation in a form of intro. Dark falls and atmosphere opens the first seconds of digital story. Bit underlines the ambient form of sound and ensemble. Night rules over every segment of “carpet” melodies which are followed with gripe leads. Lowy effects add greasy surface to theme which underline this mystical orbit. It could be free to said that this track, without any doubts, can take a place in new age horror movie with dramatic and rapid changes between scenes. The essence effectively achieved! Sedate kick with cooperation of small glitch elements takes us to the main theme of this compostion. Standard and extremely well arranged lead announce one neo trance story with sound that is somehow slightly became the trademark of this style. I like the gradual opening up of lead till full, let’s say, playing (i guess that producer will say-attack moment or else…). Fat lead, which is “under” the theme, is full hit in some kind of support to other oscilations of sounds which are underlined. Arrangement is minimal and simple, which is the point by my opinion. “The essence and simplicity”-as my friend love to said when commenting this style. When i read the name of this Hungarian producer, my lobe of the ear reacts like a radar. Many times i caught myself that i really take attention on his style. I had a chance several times to hear his work through various dj sets and it was clearly given to me that he is a very interesting composer. The most interesting of all is that when i listening something new i really heard something new and different. It is also the case and this time. Specifically, track begins with not so much different style, which is already recognizable for this artist. Easy bassline fraught with a light rhythm and “tubed” melody. Minimal range of colors and essence turns theory of this style into practice. I love hats which are, as track goes, discretely attaching on rhythm. There are also perfect. Theme that constantly repeats the same one story, with that repeating just put the accent on the track flow and that, in my head imaged like space laser sound from 19xx and who know which year. Great moments. I hear electronic music from 80’s mixed up with current story. Repetitive bassline, that become stronger in one moment, increase the rhythm of track in theme and on the dance floor. I am sure in this, although i heard it only at home for now. And then comes the moment that, if he will be heard on the dance floor, everybody will scream!! ACID!!! Very old style of some TB 303 or something else, i only know that it takes my breath for a long time. I simple love this sound and he is always welcome. Track get total vibe of project that i had a chance to listen ’93 on the well-known Greek “Star FM” radio when they plays Union Jack, Empirion and other Old School team. Perfect! Wonderful! It has really throw me back to past. Deep fall mmmm-like they asked me. Rattling percussion and very tiny clap! Does we need more than that. After the EP Breitseite from the same label and track “Devil Is In Detail” I expect that every new step will be in full bloom. The perfrect compostion and very strong and energetic bass lead position. Reminds me a lot, especially notes, to “Elektrochemie LK – When I Rock” digit that i loved and still adore. Original mix of this track i have not had a chance to hear, but judging by this rmx i couldn`t say that it has many diverges, and also this work file was given by very respectable project. Calm and deep club sound that definitely makes to stomp with closen eyes. Don`t know for you, but i am enjoying. As i know, this project is well-known because behind him is good ranking producer for this kind of sound. I didn’t heard lot of works from him but after this track it is my “duty” do give my best and to find more about this story, even if i already heard many times for this project. I will not comment rhythm because it is totally correct and within my expectations. I will only say that theme of track which is, more or less, accompanied with every upcoming sound, which is connect on pad who start that sound, it extremly remind me on Extrawelt style of dictation. It is a huge plus from me. Note record was, gently said it, fascinated to me. Oscillations of leads which follows him and even female vocal, completed this experience. The only thing that I would perhaps change, just a little, is a repeating of the so-called “motor” sounds that starts from the half of track and extends until the end. Maybe is better, not to cut him, but only to, just on a couple moments, diminish the dynamics so that other elements show their thoroughness. Of course, the detail does not impair the impression that track left on me from the very beginning. Understand this as you please, but who loves acid sound, he will know to show respect for every second of this track. I am one of them, so no one should wonder why i react like this. Even when track not have so good theme this sound will conquer me, which is not a case in this track. Here a the theme and sound give the same kind of satisfaction. Compound of dark, old school and sour are just enough ingredient that will make a cake that taste good. This track goes in same position as third track from this compilation. I mean that the same moment connect me for one and for another track. In general I always get trilled when i hear “train” rhythm. I like to hear that rhythm even in pure trance sound. Great play with percussion and their infiltration through the same triplets. About other elements, i only disagree with “bell” lead, but because it is not too often it doesn`t make any interference. For my taste that sound could be some more “talking story” moments. I already said what i mean about this kind of sound so i will said again, i love this kind of sound. And regardless of that, as this kind of expression in techno music becomes more and more popular, i get never enough of him. I don`t know how many the others descry background elements, but if there are similar analysts like me, then you clearly know what background effect gives emphasis to story and thus carries the whole theme. Higher frequency sound played with triplets. It shave through all the time in back and from time to time it oscilate emphasizing louder or weaker. I am glad that also in this case artist does not diverges from repetitive theme that really dont`need to change when is already took sympathies in my case, and i hope in case of many listeners. Generally this kind of rhythm i could listen, without any changes, through the whole lenght of track. Even in a loop variant first part of track could be used for back in mix with other tracks. Dj’s said for that kind of part -“Dj Tool”. But later developing of theme, track gets his own story and it could continue to develop by itself. If I would found myself on the other side of Dj panel, i will use this track in already mentioned way. Rhythmics took full attention. When we talk about Deep Techno, with full rights i can conclude that this track is my vision of that style. Very atmospheric, much more darkly and full of reverb. The theme of track is great. Rhythm, upgraded with every next bar, opens new background for next elements. I really like playing of timpani, which is based on deep melodies as well as mild acid note record who actually represent main theme of track. Break is filled with mild fade-in in rhythm and so-called hall effect are one of the main factors that instigate soft tension and return to already played themes. Mystical, deep and melodic. Target hit! I think that this is one of the fastest and maybe even the fastest track on compilation. Here is also expressed the depth of style. Let’s say that this track to all their elements, because of higher tempo or something else, throws a lots progressive moments. I had a chance to hear some earlier work of this artist, and this is one of the project for which i could, on first listening, presume who is it. Quite a unique style of composing. Very open sections which are full of so-called “burst” on breaks in smaller and on bigger crossings. Also, present of mystic in atmosphere does not stay away and i could say that generally, all tracks, are implicated and sorted according to some similarities that characterized with equivalence between styles that this compilation presents. When we all put together, this VA is total refresh for my mind. Finely selected, discretely packed and nicely offered to a wider auditory for listening and fun. None intrusive and by any means expressive. Leisurely introduction, amplification and conclusion. Intelligently and sophisticated. In one word-GREAT!!! Hey Alex, keep up the great releases.. this one most definatly looks interesting. Great website !! Oh geez, you have no idea how much this hit the spot. I was slowly veering off the psytrance into realms of tech house and other degrees of minimal, but when I heard the atmospheres in this release I was pulled back. The beats just swing back and forth with all their clickiness and grindiness like some kind of disfunctional cosmic clock, a true techno sound ticking along with the ever changing times. Then from nowhere come these mysterious atmospheric sounds that immidietely change everything around making familiar things seem distant and opening new frontiers so vast that you could drown just staring in them. That and the fact that I simply find solace while listening this music. Simmetune – Der Flächenzauberer : certainly the best track of this release. They are all good. But Bitshift’s is a belter. The Download links don’t work at the Moment. Seeing as other releases do work, maybe just happening to this release.